This installment delivers support for printing. 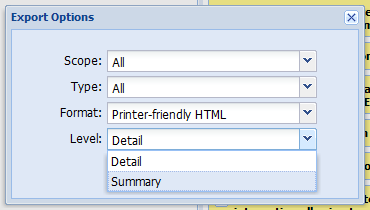 The feature is implemented as export to a printer-friendly HTML page. You can generate either Summary or Detail report. A summary report lists the names of the tasks only. A detail report lists all the data for every task in scope, which means it can get quite lengthy. As with CSV export you can choose to export either all tasks or just the tasks visible on the dashboard as well as specify whether to report on all types of tasks or on a specific one. The tasks are sorted according to the currently active sort order, which you can select per task type in the dashboard. Force-refreshing (Ctrl-F5 or similar) your browser window should be enough to get the printing feature handy.